When a friendly mouse knocks at his door, Bear sternly points to the “No Visitors Allowed” sign. Returning to his breakfast preparations, he opens the cupboard only to find the mouse tucked inside a bowl. “Perhaps we could have just a spot of tea,” the ever-hopeful guest suggests, but he is again shown the door. Despite boarding the windows shut, stopping up the chimney, and plugging the bathtub drain, the persistent rodent keeps reappearing. Finally Bear admits defeat, “I am undone,” and agrees to set out a snack. Much to his surprise, Bear enjoys the company and shares jokes and demonstrates a talent at headstands. The visit prompts him to reconsider his sign: “That’s for salesmen. Not for friends.” Denton’s softly hued watercolor illustrations capture the humorous interplay between the unlikely companions. The fastidious, pot-bellied bear wears a tiny apron while the wee mouse with a big personality peeks out of such unlikely places as an egg carton. “A Visitor for Bear” won the E.B. White Read Aloud Award! “A Visitor for Bear” won ForeWord Magazine’s Book of the Year for Picture Books! 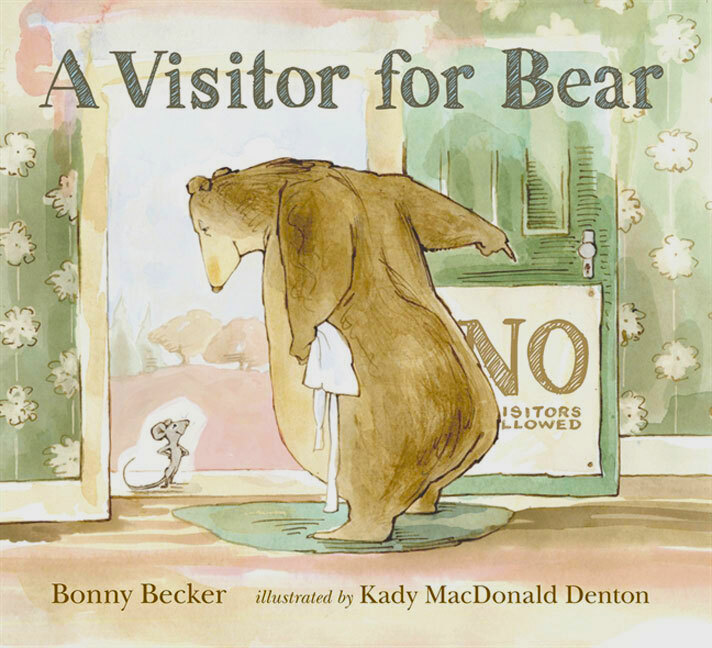 “A Visitor for Bear” received a Golden Kite Award for Picture Book Text. The Golden Kite Award is the only award presented to children’s book authors and artists by their peers. Amazon.com has picked “A Visitor for Bear” as the best picture book of 2008! 2009 Notables Book of the Association for Library Service to Children (ALSC). “A Visitor for Bear” received a Blue Ribbon from the Bulletin of the Center for Children’s Books. Blue Ribbons are chosen annually by the Bulletin staff and represent what they believe to be the best of the previous year’s literature for youth. Eric Carle Museum of Picture Book Art named “A Visitor for Bear” one of its Picture Books of Distinction in 2008. “A Visitor for Bear” has been selected for the new Oprah Children’s Book Club as a great read for 3-5 year olds. The list was compiled by the American Library Association. Hear Scott Simon and Daniel Pinkwater read a slightly abridged version of “A Visitor for Bear” for National Public Radio! This entry was tagged visitor. Bookmark the permalink. …The rhythmic text quickly falls into a pattern: the mouse surprises Bear, Bear gets angry; the mouse politely suggests “a spot of tea” or “a crackling fire”; Bear, growing increasingly desperate, orders the mouse to leave (“BEGONE!”). Denton’s warm and inviting illustrations belie Bear’s inhospitable behavior, and Becker’s energetic narrative encourages listeners to participate in telling the story. Fifty-six pages is long for a picture book, but the story zips briskly along, facilitated by effective page turns and not much text per spread. … A surefire storytime hit, “A Visitor for Bear” won’t wear out its welcome. ~ k.f. …Charmingly droll, watercolor, ink and gouache illustrations, excellent pacing and the contrast in the sizes of Bear and mouse are a perfect comedic mixture. Kids will giggle each time the mouse reappears and grin with satisfaction when big and little become friends.